HOT40 Skeleton Missile Troops and HOT41 Skeleton Spears released! This pack contains sixteen randomly selected white metal miniatures in 15mm scale. Six different poses of Skeletons armed with missile weapons including bows and crossbows. Dressed in a mix of armour pieces or no clothing at all they suit many fantasy settings. As with the rest of the HOT range you have the choice of purchasing one pack or three packs saving 10% or a sampler containing one of each pose in the pack which is great for skirmishing. 4.00GBP per pack. Go HERE. This pack contains sixteen randomly selected white metal miniatures in 15mm scale. Four different poses of Skeletons armed with spears. Dressed in a mix of armour pieces or no clothing at all they suit many fantasy settings. As with the rest of the HOT range you have the choice of purchasing one pack or three packs saving 10% or a sampler containing one of each pose in the pack which is great for skirmishing. 4.00GBP per pack. Go HERE. 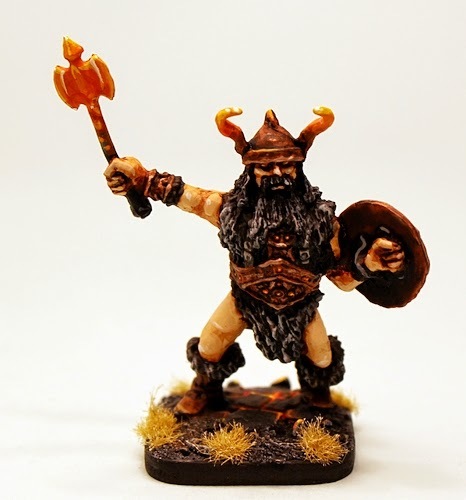 These packs are great for all manner of 15mm scale wargame system from HOTT 2nd Edition to Age of Might and Steel (AoMaS) and USEME UM002 High Fantasy as well as Songs of Blades and Heroes and many others. Great fun and great value. We will be further expanding the Undead in the range in November so look out for details of this and I would like to thank everyone who submitted ideas to us for new packs. I will take this moment to say that we will not be doing any high medieval or imperial type Humans as these can be found already in great quantity in the 15mm Altuos Historical Range including infantry, cavalry, command and artillery. 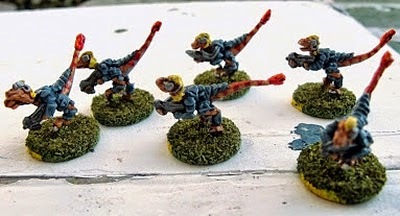 The excellent space raptor range by Loud Ninja Games has sold many thousands across the world and I always look forward to spotting some examples of the Chuhuac painted up in schemes other than the official ones. Mad Mecha Guy is the chap to whom these fetching in blue 15mm miniatures belong. The pictures depict poses from RAP001, RAP002, RAP003 and RAP004. Below you can see an example of the white armour scheme from the 15mm.co.uk website. The difference is quite striking and the space raptors look very nice painted up in blue. Well done MMG! Back in the summer of this year 15mm.co.uk asked hundreds of its customers what they would like to see as the next expansion of packs in the superb HOT 15mm Fantasy Range. There was an acre of feedback and it was tough to separate the leading requests by their popularity but in the end the subject that topped the table was The Undead. The rattling of bones and the leering grin of a skeletal skull. This was the stuff of new wargamers dreams for 15mm Fantasy as the comment at the top taken from the survey demonstrates. The current HOT40 is being up gunned with additional skeleton missile troops. These poses add to the original skeleton archer in the pack. Added poses are another three archers in varied stances and two poses of skeleton with crossbows. This makes a new total of six poses in HOT40. Dressed in a mix of armour pieces and clothing they will suit most settings from classic fantasy to dungeoneering and medieval fantasy crossovers too. The current HOT41 is being 'fleshed out' with additional spear toting skeleton troops. 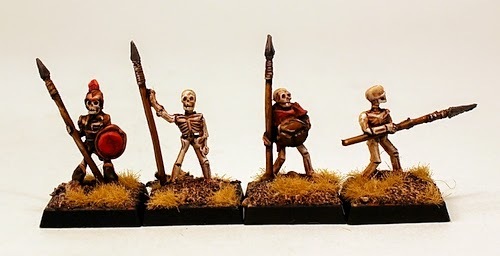 These new poses add to the original two skeleton spearmen in the pack. Added poses are another two skeletons in armour and clothing with spears. This makes a new total of four poses in HOT41. They fit in well with the rest of the HOT Undead Range of packs and will suit the same settings as HOT40 for example. 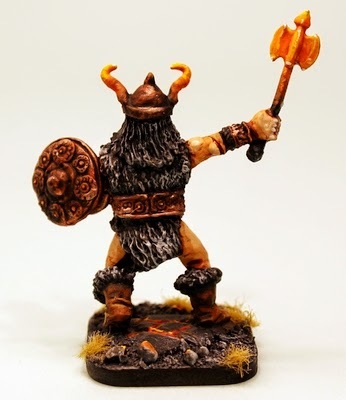 As with the rest of the HOT 15mm Fantasy Range we will be offering the purchase choices of a single pack or three packs with a ten percent saving or a sampler with one of each pose in the pack (great for skirmishing or dungeon crawling) all at great prices. 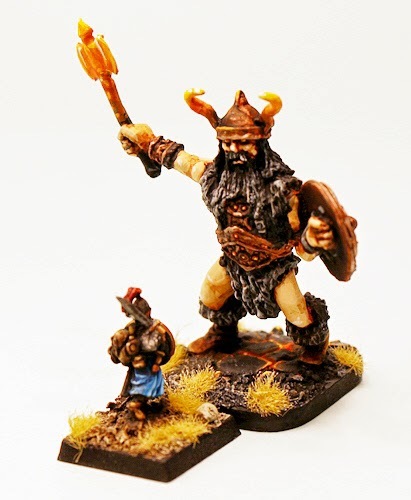 Suitable for any 15mm Fantasy wargame rules system from HOTT 2nd Edition to Age of Might and Steel and others such as Song of Blades and Heroes. We begin the releases on Wednesday 29th of October 2014 with these two codes. 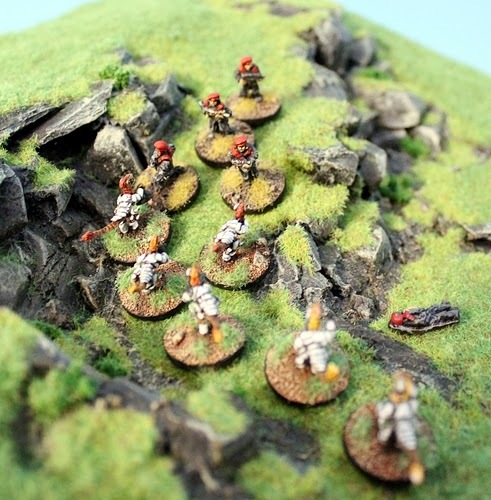 These can all be found on the HOT 15mm Fantasy page of our website HERE. If you have ideas for HOT then I always want to hear them. The range almost always expands on the back of wargamers requests so comment here or all the better email me direct and let me know what you would like to see. There will be a second part to this expansion of the Undead in the HOT range next month as we have even more codes coming. But no spoilers at this point as they are still very much in the works. We have a great offer for the next week or so on our website. 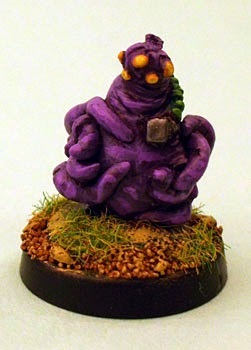 The offer is half price (50% off 0.28GBP from 0.55GBP) every one of the Vergan codes in the 15mm SHM Science Fiction range. Designed by Eli Arndt the Vergans are space opera bug eyed monster fun. There is no official story for the Vergans unlike the one developing for the Prang. If you have ideas then do let me know. Heck we might even more some more in the future. 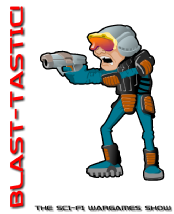 This Saturday the long anticipated wargame show Blast-Tastic is happening in Bristol in the UK. The show is a new venture specialising in science fiction wargaming mainly in the 15mm scale. We had planned to attend the show but due to circumstances beyond our control (other meetings we had scheduled on the near thousand mile round trip pulled out on us!) we have had to cancel. This has upset us greatly so instead of attending we are extending a weekend offer instead. If you are in the UK and near enough to consider attending please do so. Here are the details of the show. We wish Mike and Blast-Tastic all the very best for this weekend.